I'm still working on Bristow. 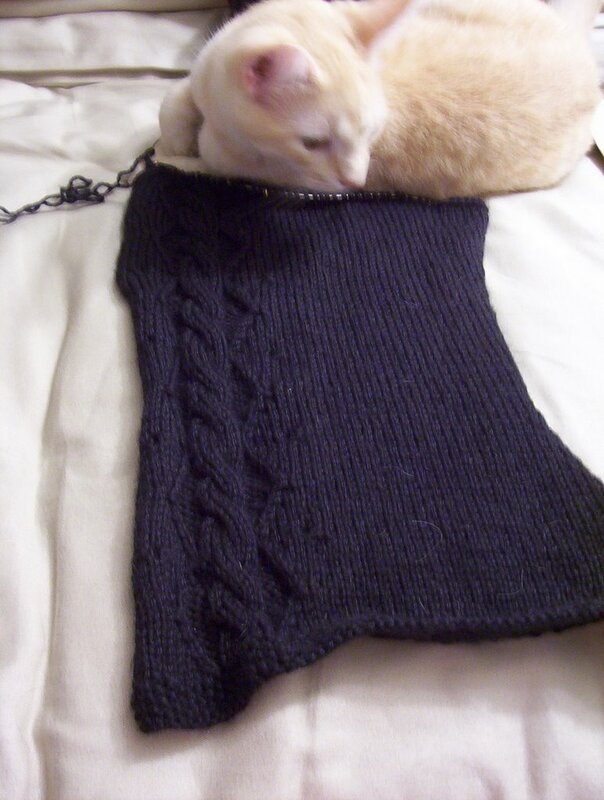 I've reached the first bindoffs for the armhole on the front left side. I don't know why I've set it aside the past week or two--with the decreases it will go much faster. I also started another pair of socks, from the "chocolate raspberry" Koigu that Jennie sent me for SP8. 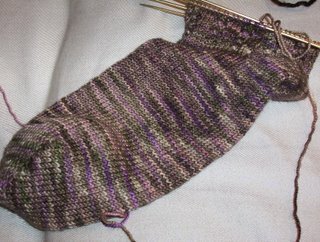 I had intended to use them to make a different, more complicated pair, but I changed my mind and decided to make these "mindless knitting" socks. Can I just say that I LOVE the colors of these socks? I love how pink and brown look together. I've also got an Odessa hat still on the needles, but no pictures, since my AA batteries for my camera are in the charger at the moment. I had to frog the green Odessa hat I started for my roommate's cousin. I didn't make it long enough. But that's okay--I will still enjoy making it again. I guess I'd better hurry, though: the cold weather's coming! SP9 started this week. I'm looking forward to another round of a great game. My answers to the questionnaire will be up shortly, at the link to the right called "100 things about me". Just so you know, I've not yet thought of a hundred things about myself to post!